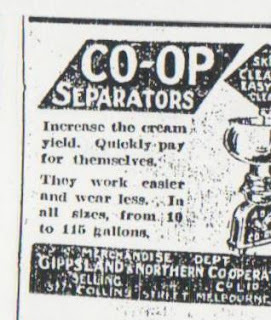 from farm to factory: Gippsland and Northern Co-operative Co. Ltd. Lately I have been digitising a collection of small adverts for Australian manufacturers of dairy machinery that was kindly passed on to me from Margaret Simpson, a curator in all things agricultural and mechanical at the Powerhouse Museum, Sydney. 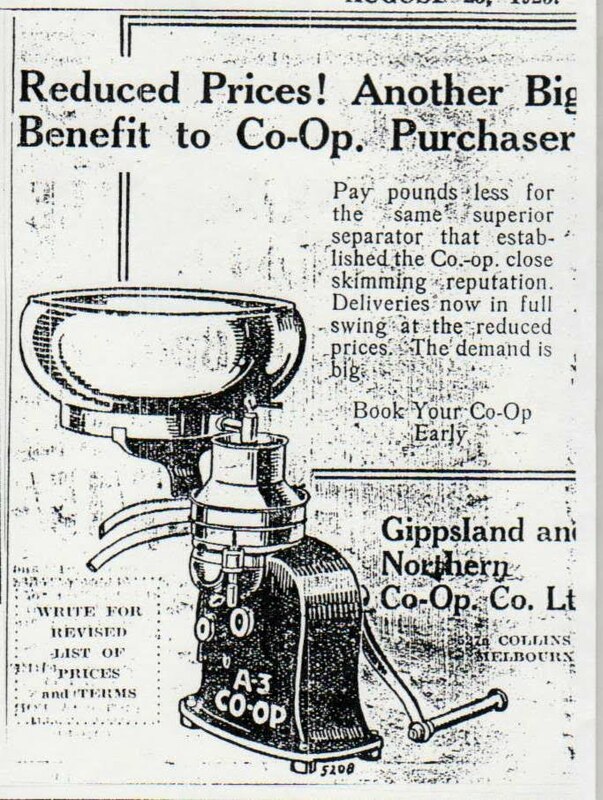 One company that kept appearing throughout the collection was the Gippsland and Northern Co-operative Company Ltd., which had me thinking about about our friends over at Old Gippstown, closer to events in Victoria. 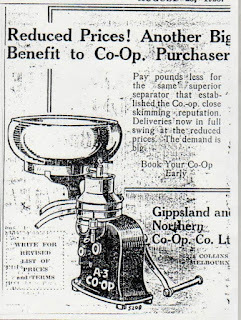 The Company are a well known produce seller, however from this assemblage it also appears that the Company was selling machines to the farmers through a dedicated Manufacturing Department (based at 607 Collins Street, Melbourne). 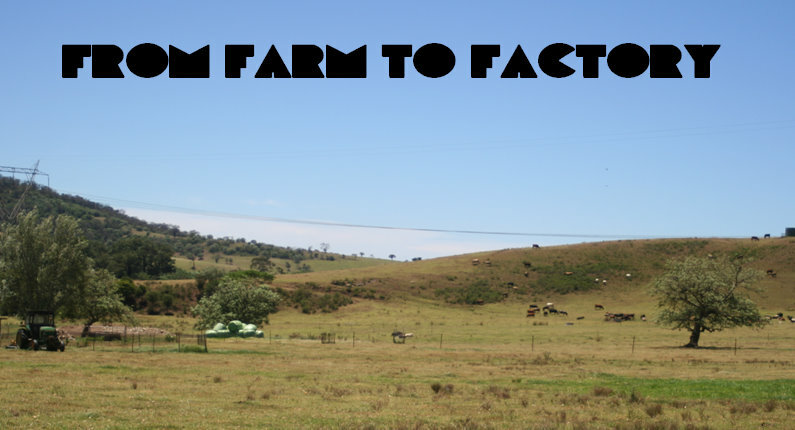 In two other articles, the Company is identified as acting as auctioneer for real estate and cattle sales. 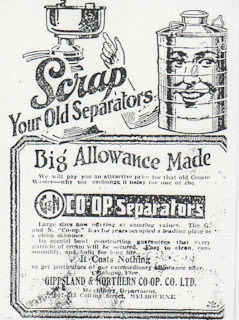 So Old Gippstown, have you any collection items that may tickle our interest in learning more about this important company? Ooops, have only just found this post. No - we don't have any items, but I do think this company grew out of the Co-operative movement. There is something in the back of my mind about one of the founding directors being there because he was on the Board of the Heyfield Co-operative Dairy Factory. Must go and have a dig. Back soon. 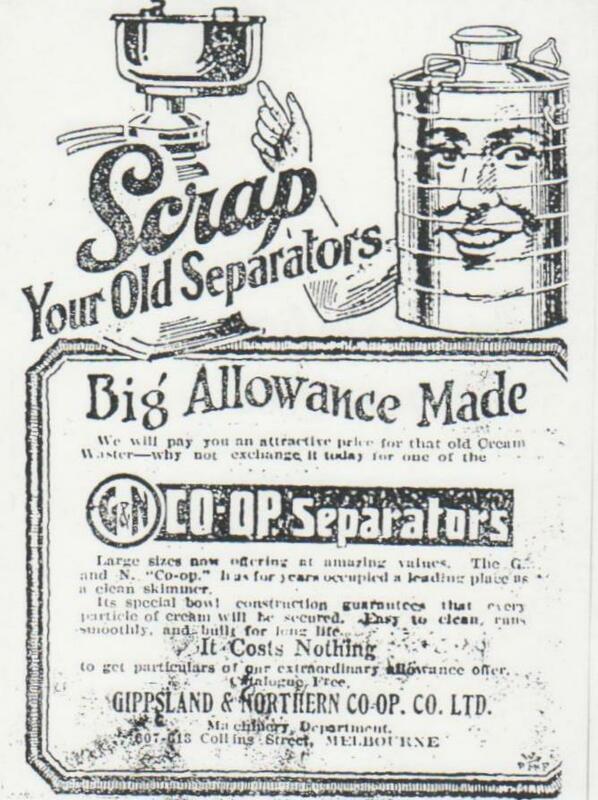 The Old Gippsland Collection has the home of a former director from Dumbalk, but no smaller items. The Maffra Collection has a number of parts from G&N milk processing equipment, and a file about its acquisition of Thomas Standing and Co, auctioneers (pigs, from memory) from Newmarket in Melbourne. So it appears to have started as a selling company, then branched out into manufacturing. I reckon I can remember G&N being around until reasonably recently as a Stock and Station Agency. Final report - The Gippsland Co-operatives merged with (or took over) their North-Eastern Victorian equivalent 1910-1911. Gippsland and Norther traded in its own right until 1992, when it was taken over by Dalgety's. As far as I can see, Dalgety's was then taken over by Landmark in 1993. I think this is a water pump or milker from gippsland and northern, I recently restored it after I found it in my grandparents shed, is it rare? yes I do. I found an old dairy can made from solid copper. See some photos of it on my website under other coastal finds. www.coastalvintage.com.au made of solid copper. I have a G&N stationary engine, which was made by Ronaldson Tippett with slight styling and a color change and sold under the G&N badge.